Animals & Pets Joomla templates are designed for pet shop owners and can be also used for websites of dogs and cats breeders, pet trainers, pet groomers and pet hotels. 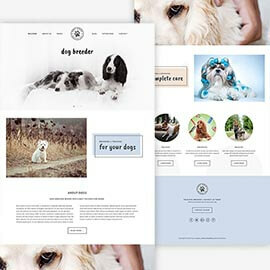 Dog template is dedicated for dog breeders and all websites which primary business is related to dogs. You can use to to create websites for dog trainers, dog groomers, pet shops and similar websites.